A superficially charming and very prettily shot film with all the depth of a postcard. I had high hopes for this movie. A writer goes to Paris to work on his fledgling novel and is magically transported back to the 1920s at their heyday to hang out with the creme de la creme of expat American authors, artists like Picasso and Dali, and later on even some Belle Epoquians - how could this not turn out to be amazing? Woody Allen, who wrote and directed the film, provides a 94-minute answer this question. Sarcasm aside, the movie does have its strengths. The premise - unfulfilled screenwriter Gil Pender (played by Owen Wilson) is transported back in time each night at the stroke of midnight - has potential, and the actors (with a few exceptions) make a lot out of their roles. 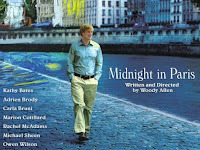 Owen Wilson's interpretation of Woody Allen is certainly more agreeable than Allen's own, and the cinematography is gorgeous - who wouldn't want to move to Paris after seeing this movie? And yet - the pretty shots of Paris are symptomatic of the film's central flaw: it's completely superficial. Paris is filmed like a film set, with no grit or realism - my father said the movie looks like it was sponsored by the city's tourist board. I'm not saying that films need to be set in drug dens with boarded-up windows to be meaningful, but Midnight's depiction of Paris, people, relationships, and life in general is characterized by a complete lack of self-awareness. Most flagrantly, it's ironic that Gil's fiance Inez (played by Rachel McAdams) is set up as the film's sort-of antagonist for living in a bubble of materialism - Gil is far from down-to-earth himself, his faux-humble demeanor aside. Though a writer, he is shown to be far from struggling (he's just unfulfilled, a condition for which the hashtag #whitepeopleproblems was invented), and though he may make hollow jibes at the ostentatious lifestyle of Inez, her friends, and parents, he's happy enough to reap the benefits of champagne lunches and lavish hotel suites. The way Midnight - an alleged "romantic comedy" - portrays romantic relationships is...comedic. Gil and Inez are depicted as doomed from the start - there's no indication of why they're close to being engaged and what attracted them to each other in the first place. Accordingly, the movie gives us no reason to root for this couple at all, and the ultimate demise of their relationship is both predictable and dull. As for Gil and Marion Cotillard's character - if he's really as truly and utterly in love with her as he says, why does he just let her go so easily? I don't disagree with him leaving her in the Belle Epoque, but it isn't really portrayed as a struggle for him. Though to give the film the benefit of the doubt, this could be a realistic manifestation of Gil's ineffectual nebbishness. And the film's main insight - that people will always idealize the past, and should focus more on making the best of the present - is presented without any sort of subtlety. On to the positives again: Rachel McAdams makes the most of her one-dimensional role together with Mimi Kennedy and Kurt Fuller Inez's parents, and Michael Sheen as her pretentious academic friend. Though the characters are charicatures, they're just horrible enough to be real - and the actors are clearly having fun with their parts. 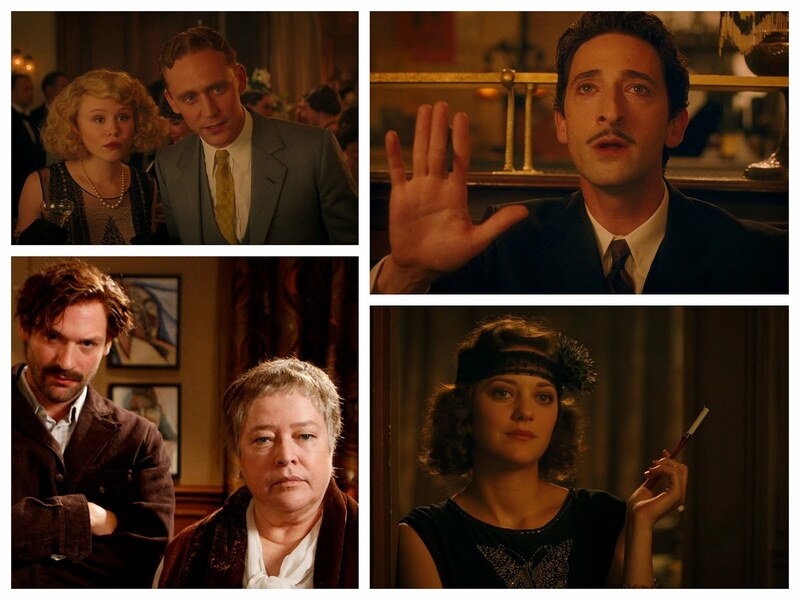 As for the historical characters: my favorites were Kathy Bates as Gertrude Stein and Adrien Brody as Dali. I normally like Tom Hiddleston, but found both Fitzgeralds slightly overdrawn (ditto Hemingway, though less so) - very much "I'm playing F. Scott Fitzgerald, old sport, and have you seen the brillantine in my hair and my center part?" I personally would have liked Gil to spend more time interacting with the pastos (you know, people from the past), and see them become more fully actualized characters. But then again, perhaps they were never meant to be more than wish fulfilment figures, who praised his novel while taking him to the best parties, and most importantly allowed him to grow. And though the nature of Gil's time travel is never explained (which I appreciate), the way he saunters into the past hints at the possibility that the entire time travel element was a figment of his imagination, with the historical folk giving a voice to his subconscious. And the film remains somewhat ambiguous about Gil: though he's too oblivious to realise that Inez is having an affair, he's also perceptive enough to grasp it on a subconscious level and put it in his novel. So ultimately: if the film is actually meta, making fun of pretentious faux bohemians like Gil who think moving to Paris will give them more depth (while mocking the bourgeosie for its own pretentions) - then mission accomplished. But if we're meant to sympathize with Gil and applaud his brave choice to break up with his cheating rich fiancee with whom he has nothing in common and move to a city where he can walk in the rain with a fellow-minded soul - then I, for one, was not won over.